Located to the South-Western part of Central Asia or the “Stans”, the southernmost territory of the former Soviet Union between Iran and Afghanistan to the South-west, Uzbekistan to the East, Kazakhstan to the North and the Caspian Sea to the West, Turkmenistan is a unique country. It is the land of ancient civilizations from the Bronze Age to the early Silk Road period. Prehistoric towns like ancient Merv, Nissa, Anew and Kunye Urgench, the ruins of which are spotted all over the country were main stopovers on the Great Silk Road. Saryk and Chowdur, who kidnapped men from the territories of Russia and Persia and supplied the slave markets of Khiva and Bukhara, once roamed the Karakum,” black-sand” desert», that makes up 80 % of the country. The desert is rich in flora and fauna, some of which are endemic to this region. Some stunning natural landscapes like limestone canyons, karst caves, salt lakes and mineral springs can be found in the mountainous and deep in the desert areas of this country. Ashgabat, “the city of lovers”, the marbled metropolis with world’s biggest number of white marbled buildings with futuristic architecture is the country’s capital located just a few kilometers from the border with Iran. Nowadays the world famous carpets of Turkmen carpet weavers, Ahalteke horses, embroidery and jewelry of local artisans and humble, hospitable Turkmen locals make it worth a visit of this beautiful country. 488, 100.sq km (slightly bigger than Sweden or the state of California). US$1 = 4,26 Manat (March,2017). Hello (salawmaleykim); Thank you (Sag bolun), good bye ( Hosh sag bolun). 85% Turkmen, 5% Uzbek, 4% Russian and 6% others. Turkmenistan hosts a vast number of fascinating monuments from the time of the Bronze Age, the Early Silk Road Era through to the arrival of the Mongolian armies, when Margush, Nissa, Merw and Kunya Urgench were centers of the Bactrian-Margianian civilization, and of the Parthian, Seljuk and Khorezm empires respectively. 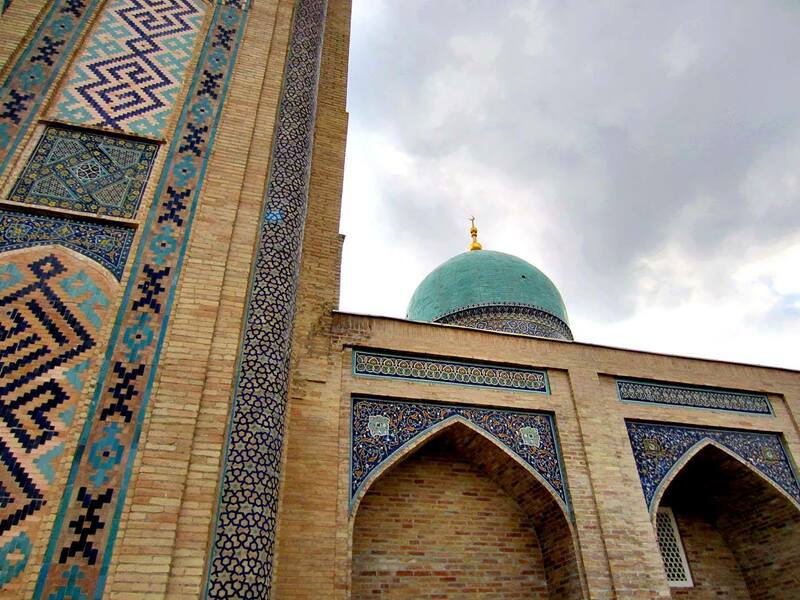 The development of a distinct Turkmen national identity started with the arrival of the first Turkic peoples into the region in the 10th century. Their descendants established the various Turkmen tribes, such as the. Through the centuries the Turkmen people have managed to retain their tribal peculiarities and traditions. 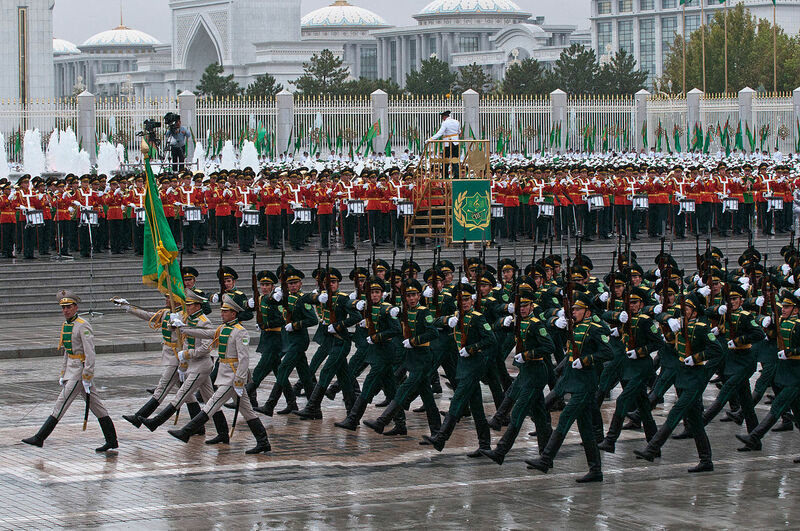 the values that still mark Turkmen people today. Turkmen artisans still practice centuries-old crafts, from carpet to jewelry making and silk weaving. And although almost 80% of Turkmenistan is made up of desert, Turkmenistan also offers surprisingly impressive and varied landscapes, flora and fauna. Subtropical forest valleys, limestone canyons, karst caves and salt lakes can be found in the mountainous parts of the country. The numerous mineral springs that can be found throughout the country can be enjoyed at several excellent sanatoria. And Awaza at the Caspian Sea offers top quality resorts at the beach. We invite you to visit Turkmenistan, where you can experience nature's beauty and historical monuments, where old traditions come alive and where you can step from an ancient culture into the world of modern post -independence architecture, where hospitality and friendliness of the Turkmen people are as warm and constant as the hot rays of the Sun. 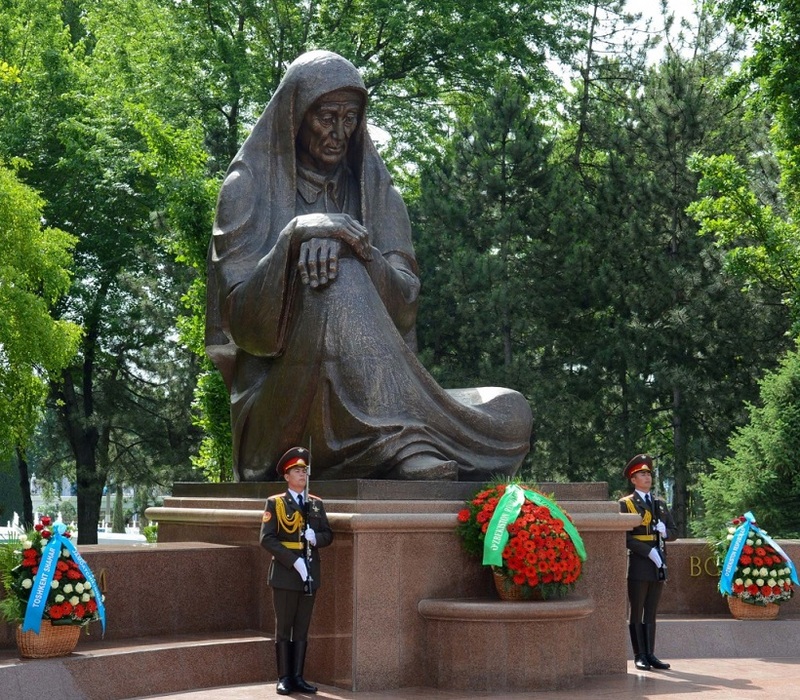 Turkmenistan is a country with a unique and remarkable history. The Turkmen or Turcoman are traditionally a nomadic people,who are the descendents of several separate tribes or clans, called Tekke (around the oases of Ahal, Tejen and Merv), the Ersari (along the Amu Darya), the Yomud (in the Balkan Region and Khorzem Oasis) and the Goklen in the Southwest. Each tribe has its own style of dress and the members of each tribe speak a different dialect. Honesty, respect for seniors, sincere generosity and lavish hospitality are the renowned features of the Turkmen. In every household a visitor will offered tea and food before even before he is allowed to explain the reason he has visited this house! One of the most important values for the Turkmen is always maintaining friendly relations with their neighbors, as they say "If your neighbor is at peace, you are at peace too." In the Turkmen culture strong family traditions have always played one of the most important roles. That is why weddings and the birth of children hold the highest priority in this society. Though there are some changes in the modern Turkmen society, the traditional customs and rituals of the matchmaking process and the wedding ceremony are still precisely observed. Though wedding traditions have many similarities to their Central Asian neighbors, a few things make them uniquely Turkmen. Most families, besides the traditional visits and gifts between the two households, arrange the date for the matchmaking meeting, the wedding and even the direction from which the bride arrives at the groom's home in accordance with the position of the stars and planets. The bride’s family furnishes her new home with modern appliances, household tools, as well embroidered items, carpets woven by the bride herself. The marriage ceremony is a large-scale event with a big expense which is paid by the groom’s family and to which 300 to 500 guests are invited. Young women and girls come to the wedding wearing brightly colored scarves; during the procession to the groom’s house, it’s traditional to give small scarves or pieces of cloth to passers-by to turn the evil eye away from a young family. Like in most parts of the world, a banquet with music and dancing follows the wedding ceremony. After the ceremony the couple return to the groom’s house accompanied by her girlfriends, aunts, nieces who sing a traditional song called “yar-yar” meaning “fiancée, fiancée”. While bringing the bride to her home she is One of the interesting elements of the wedding tradition is that, while entering her future husband's home, the bride must take the first step with the right foot - otherwise, it is said that there will be troubles, illness, and quarrels with the in-laws. Another tradition is that on a wedding day, a Turkmen woman will give the embroidered skullcap she wore as a single girl to the youngest sister of the groom, ensuring she also will have a happy marriage and give birth to many children. Turkmen cuisine is typical of Central Asia and is based on both the nomadic lifestyle and the severe living conditions of the country. It is simpler than some of the other cuisines of the region, both in ingredients and in method of preparation, but just as varied. Plov, like in neighboring countries, is the most popular dish.It is the main staple dish cooked almost in every household. It consists of cubed mutton fried with onions, shredded turnip, and carrot, and served with steamed rice. Mutton also features in most other dishes, such as shashlyk, which is a variant of the kebab (meat and vegetables grilled on a stick), served in non (round unleavened bread, similar to pitta bread). There are dishes that are only found in Turkmenistan, such as ka’urma (mutton deep-fried in its own fat), churban churpa (mutton fat dissolved in green tea), and ishkiykil (dough balls filled with mutton and chopped onion, and traditionally cooked in sand that has been heated by the embers of a fire). Mostly, Turkmenistanis like to drink green tea, and you will find this beverage on offer everywhere. Turkmen melons, with their sweet honey scent, are world famous. The national dress is a reflection of traditions rooted in the ethnic history, social attitudes, and ethical and aesthetic values of the Turkmen people and it has changed very little over the centuries. 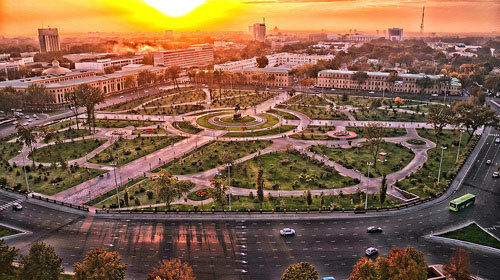 Visitors to Turkmenistan for the first time will not fail to notice the uniqueness of the country. This stems principally from the fact that the women wear the traditional national costume. The traditional clothing they wear is made of a long silk shift over narrow trousers that are trimmed with a band of embroidery at the ankle. Young married women and girls have to obey strict rules – sleeves had to cover the ankles. Silver jewellery and embroidery are obligatory elements in the Turkmen national dress for women of all ages, children and even man. Men wear distinctive high, shaggy sheepskin hats, which help keep the hot sun from their heads and, combined with their red robes over white shirts. It creates a very striking image. Richly decorated headwear, jewelry and embroidery accent even everyday clothing. 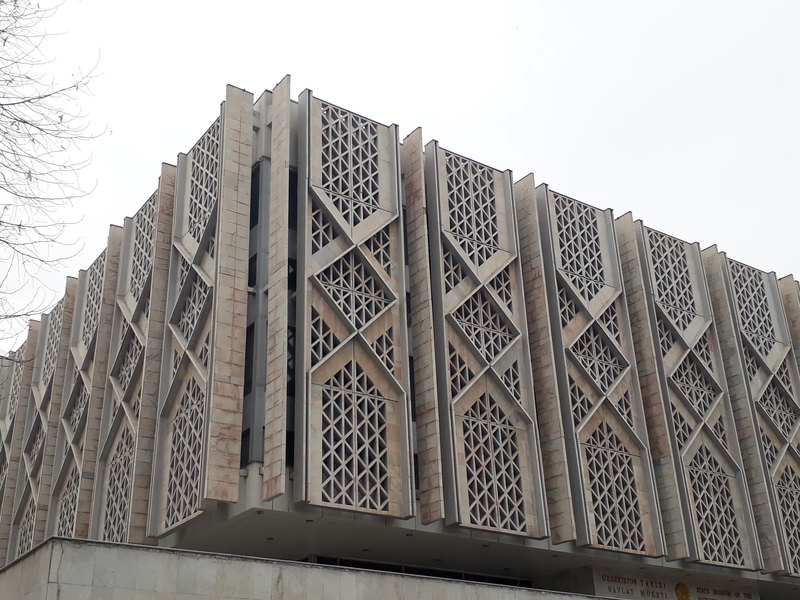 The traditional arts are rich, variegated and interesting, which include felt manufacture, jewelry making, woodwork, ceramics, and silverwork, but the two crafts in which Turkmen excel are silk manufacture and carpet making. Some of the most unique and beautiful carpets in the world are woven in Turkmenistan. These carpets, sometimes, are sold internationally under different names (such as Bukharan or Afghan).That is why many people don't realize their source. Carpet weaving is an ancient art each tribe developed its own distinctive pattern. Some of these patterns have been found to be duplicated on ceramics from the 3rd and 4th centuries B.C.! Traditionally, Turkmen carpets have been woven out of wool, cotton, and silk by women, using horizontal looms. The method of weaving has been modernized, but the beauty and quality of the fabrics remains. Designs of the Turkmen carpets have a clear geometric pattern and noble color with prevailing red tone, as, according to local beliefs, the red color possesses magic qualities, protects from the evil forces. In addition, the Turkmen people have always identified the red color with something beautiful and joyous..Origin of ornamental carpet designs has a realistic basis. Reality surrounding a carpet weaver was reflected in the carpet design: vegetation and animal kingdom, irrigated fields etc. These designs certainly stable for centuries are pronounced national character. A homespun silk that is used for the beautiful dresses worn by Turkmen women on special occasions is called “keteni”. The weather conditions of the region have always promoted cultivating high grade mulberry plantations. From times immemorial, Turkmens have been successfully dealing with silkworm breeding. Owing to its durability, brightness and beauty of design, their homespun fabric was very valued and was in big demand not only among the local population. In their embroidery artists use different patterns that are as unique as a family seal, identifying the tribe of its artist. . Visit a local family and watch as they weave centuries of beauty. Turkmen currency is called Manat. Turkmenistan New Manat (TMT) is equivalent to the old Turkmenistan Manat (TMM) on a basis of 1 Turkmenistan new Manat (TMT) = 5,000 Turkmenistan manat (TMM). The currency symbol is m. The Turkmenistan New Manat was introduced in 2009. Notes are printed in denominations of 1, 5, 10, 20, 50, 100, and 500 New Manat. In 1993, notes were introduced in denominations of 1, 5, 10, 20, 50, 100 and 500 Manat. These were followed by notes for 1,000 Manat in 1995 and 5,000 and 10,000 Manat in 1996. In 2005, a new series of notes was introduced in denominations of 50, 100, 500, 1000, 5000, and 10,000 Manat. In 2009, to counter hyperinflation, a new currency was introduced with a price of 5000 old manat for 1 new manat. Occasionally someone still says things like: “20 000 manat for these tomatoes!” Divide by 5000.The old Turkmenistan Manat (TMM) was introduced on November 1, 1993, replacing the Russian Ruble at a rate of 1 Manat = 500 Rubles. Traditional Turkmen songs feature every aspect of life, which include lullabies, songs children sing during their games, maiden's songs and wedding songs, the work songs sung during camel milking and carpet weaving. 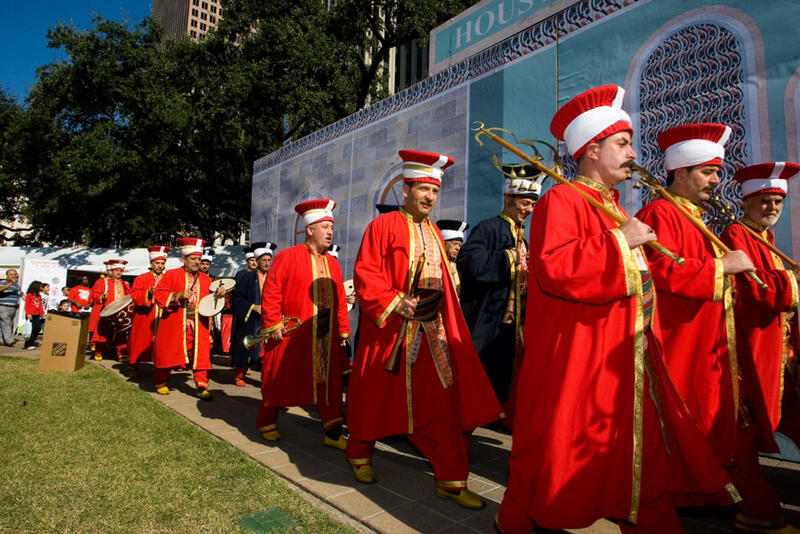 Bakhshi are the most vibrant and honored of musicians. A musician-storyteller, he wanders from town to town, dressed in special clothing and carrying his own utensils and water drawn from his own well. According to Turkmen customs, a bakhshi wears special clothes: a don (heavy cotton wool dressing gown), telpek (an Afro-like wooly cap made of white and black ram’s wool), a white shirt, soft skin boots and wide trousers. The villagers prepare for his arrival in advance. They arrange a carpet-covered platform for him, and a few meters from the fire a dastarkhan (feast cloth) is set with fruit, chel-pek (thinly cut fried dough) and other goodies on. There, by firelight, people gather to listen as the bakhshi sings, starting before sunset and ending long after sunrise the next morning. Sometimes as many as 2,000 people show up to listen to a bakhshi. The bakhshi accompanies himself on the two-stringed dutar and every two hours he will take a short break, drinking tea and chatting. The songs he sings are rhythmically chanted and are based on the epics, poems, fairy tales, legends and stories. The great Turkmen epics are often combined with poetic verses which are sung with a dutar as accompaniment. Traditional Turkmen singing is very unique. Singers strain their vocal cords to reach very high notes. The demands of living in steppes and deserts along with the nomadic lifestyle produced the habit of talking loud so one can be heard over a long distance. Such loud singing contrasts sharply with the silent gentle sound of a dutar. 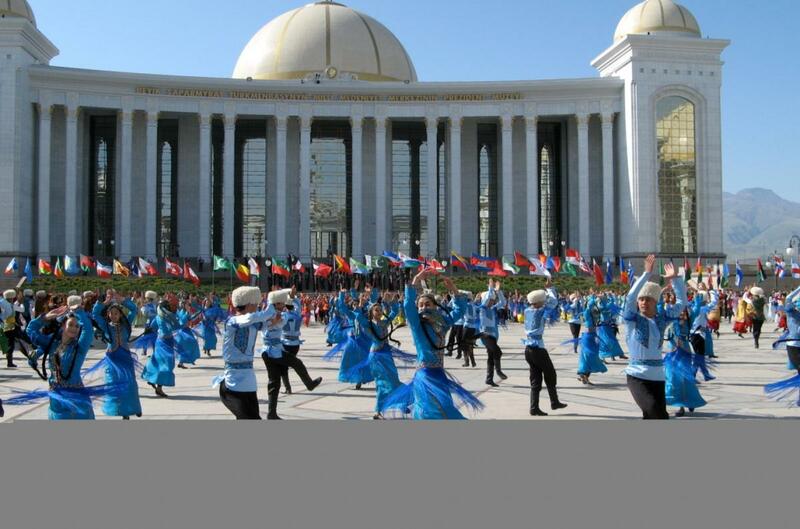 There are quite a few holidays in Turkmenistan celebrating various aspects of unique Turkmen culture and life. One of the main regional holidays is Nowruz Bayram celebrated on March 21st, on the day of spring equinox. It is a public holiday to celebrate the first day of the new year of the Iranian calendar. One of the main regional holidays is Nowruz Bayram celebrated on March 21st, on the day of spring equinox. It is a public holiday to celebrate the first day of the new year of the Iranian calendar. Communities gather for carnivals. Another important holiday is Turkmen Carpet Day, which is observed yearly on the last Sunday of May throughout the country. Exhibitions feature local arts and crafts as well as the exquisite handmade carpets unique to Turkmenistan. Carpet patterns are even featured in its flag, showing off the expert combination of color and design that gives them a special glow. 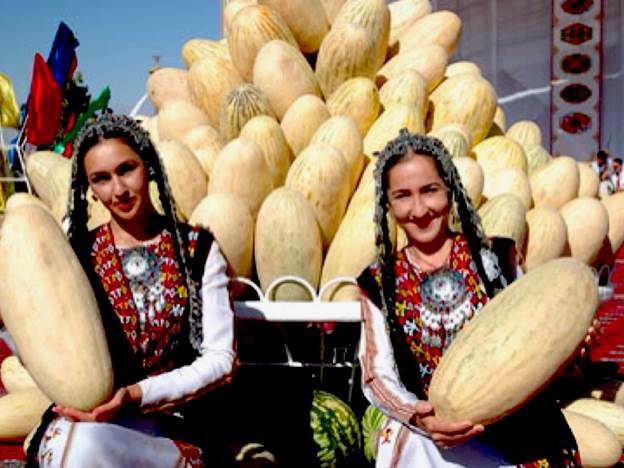 Turkmen Melon Day is a fairly new different kind of celebration, held in every province on the second Sunday in August. Festivities include displays of fruit and vegetables. Performances by musical groups and exhibitions of foodstuffs, as well as contests for the largest and best quality melons and pumpkins are held almost in every corner of the country. Memorial Day is a holiday similar to Veterans' Day in the United States. Celebrated on January 12, it serves as a remembrance for soldier who defended the Geok Tepe fortress against invading Russian troops in 1881. Women's Day is celebrated on March 8th. Women are given gifts like flowers and chocolate. Victory Day, celebrated on May 9 is a day to honor veterans and martyrs of the World War II. 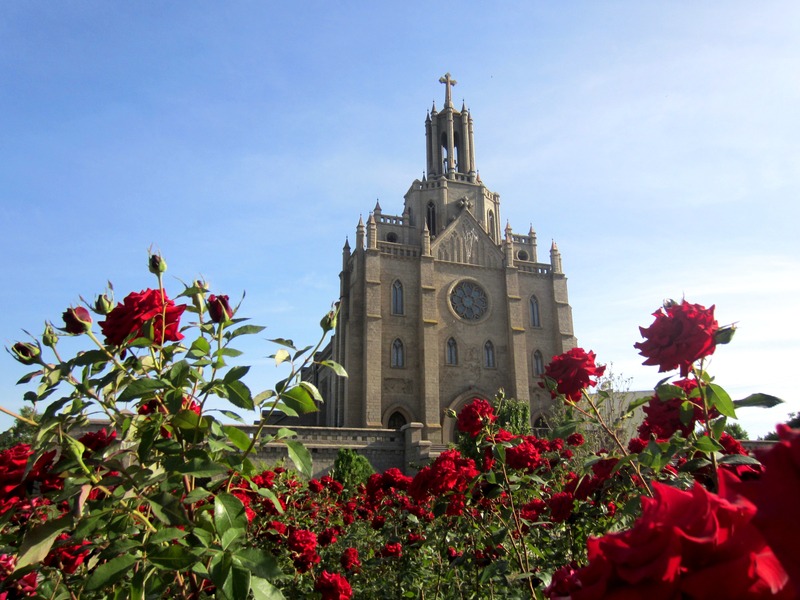 October 6 is a Memorial Day of victims of earthquake of 1948. November 17 – Students Day. December 12 – Neutrality Day. Annually three days are devoted to celebrate Muslim holidays Kurban-Bairam (the date changes each year in correspondence with the Islamic Lunar Calendar), and celebration at the end of Ramadan-the month of daytime fasting. These both Muslim holidays called “khait” as well. These are the days of family visits, gifts and giving alms to the poor. About 70 days after the end of the holy month of Ramadan the Kurban Bairam (The Feast of Sacrifice) is celebrated. Over a period of several days locals visit the graves of their relatives. Some slaughter an animal and share the meat with the family and the poor. ntricate and unique Turkmen carpets from all over the country are on display at the Tolkuchka bazaar held on Sundays. This is the largest bazaar in the country, spread out over several acres in the desert offering every imaginable type of good. Carpets, camels, household goods and vehicles, beautiful local jewelry, handcrafts of every material and design, as well as fruits and vegetables, spices and snacks. In Turkmenistan, besides the bazaar, one can purchase items at colorful fairs and supermarkets and permanent exhibitions of the national crafts. There’s no bargaining in these shops, but you will find an international marketplace that is more attuned to the modern world.